When it comes to Christmas, I am silly. Too many garish lights. Too many inside jokes. 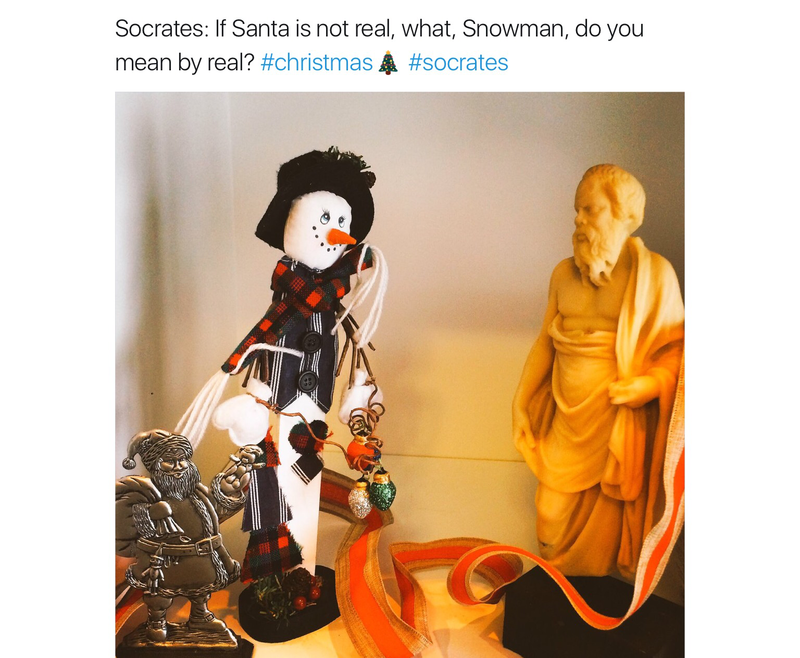 Too many dioramas involving Socrates and snowmen. I love Christmas and the broader holiday season unabashedly. But I also know that for many this has been a hard year, with lots of political upheavals and many more personal tragedies. For many, 2016 has been the worst year. Wishing it away, however, means wishing that our lives become that much shorter, that we have that many fewer days with the people we love. It means to wish away this Christmas. The Divine Comedy is really not about Chritsmas. It is explicitly set over the Easter weekend and speaks to the death and resurrection of Christ, not his natural birth. But there’s lots of reasons why The Divine Comedy would remind you of what I love about Christmas. When Dante arrives in Paradiso, he is (literally on occasion) blinded by lights. There are moony-glowy lights, dancing lights, lights that frame images, lights that form words, a river of lights, and a single, pure, piercing light. In Paradiso all is illuminated, which is to say all that is can be known, so that it is can be loved. Dante thus explains to John the Apostle, the cause of his love by saying, “love is imprinted in me; for the good, once it is understood, enkindles love; and in accord with more goodness comes greater love”(Canto 26, Paradiso). At first glance, that Dante has to explain his understanding of love to John is a strange choice. After all John’s Gospel is the most Greek and thus philosophical of the gospels. It’s not the warmest or fuzziest of stories. For instance, rather than the traditional “born in a manger” story, we get instead “in the beginning was the Word (logos) and the Word (logos) was with God, and the Word (logos) was God… [and] all things were made by him.”The logos which is normally translated from the Greek as “word,” also means reason or thought. So “in the beginning was Reason, and Reason was with God and Reason was God” would work just as well. So far so good. The divine is the truth. Even the pagan logician Aristotle could get behind this Gospel. But then we get the kicker: “Reason became flesh and made his dwelling among us.” In other words, God or the Truth made itself perfectly manifest in the finite or natural realm. And that’s the Christmas story. God made incarnate; God as a little dude, a baby even. But the reason why John’s strange version of the story is so helpful is that John’s account makes things explicit. Through that little dude, the truth, as in Absolute Truth, is made knowable, and not just for those who have the gift of poetic vision, like Dante, but rather for everyone. For shepherds, for instance. Note the traditional sparkly pink hedgehog. In the traditional Christmas story, we are given an image of this as well. For the shepherds and the wise men know about the birth of Christ because they have seen a new star in the sky and it leads them to Bethlehem. A single new star illuminates the path to absolute truth and to all of the stars that Dante eventually sees in Paradiso. 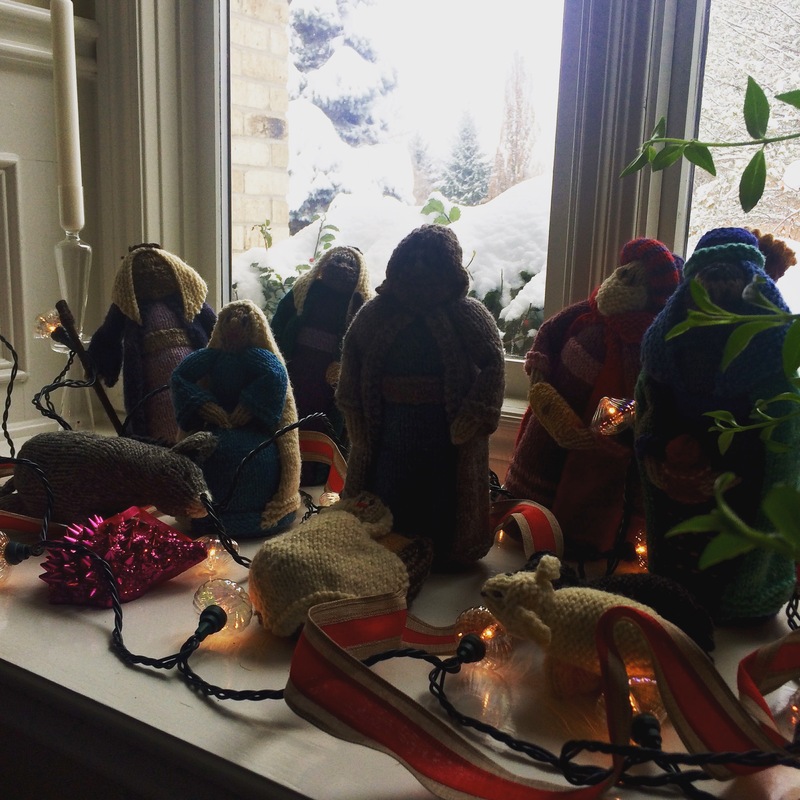 And while the little dude slips in pretty inauspiciously, born in manger and all that that entails, all of the dancing stars of Paradiso are implicit in the single star that marks his birth. Just as this star illuminates a path, and thus indicates the possibility of knowing the truth, it simultaneously speaks to the account of love that Dante confesses to John. In the image, the shepherds and wisemen are explicitly guided by this new light to a new account of god – a god that would go through the rather undignified process of birth to be laid down in a feed trough. A god whose love of the world is such that he himself descends from the rather sparkly business of Paradiso to the sometimes dim light of earth. A god whose love is such that he will overcome the deficiencies of our natures such that we might all see Paradiso, should we, like Dante, want to. Further though, and also importantly, the image of God as a baby, born in a manger and all that that entails, indicates something else about the dim light of earth and the rather poor things it illuminates. It may be a fallen and thus imperfect world, but it was made in and by the truth (or the word), and the image of Christ indicates that it will be made sufficient to the Truth again. The wise men see a new star and many of the stars that Dante sees in Paradiso are, of course, visible on earth. That God is incarnate in a natural form indicates that nature and its inhabitants might reveal something of his goodness so that we, like Dante, might love it. Dante thus continues to explain his love, saying, “the leaves enleavening all the garden of the Everlasting Gardener, I love according to the good He gave them.” All that we love, (including my Timmy and even silly Christmas traditions) Dante indicates can indicate to us something of the absolute good. Importantly, Dante does not get to remain in Paradiso. Instead, we know from the poem that he must return to his regular life and rather irregularly be exiled from his home and the people he loves in Florence – forced to wander around Italy seeking a place to sleep and food to eat. Dante, however, does not despair nor wish his time was past. 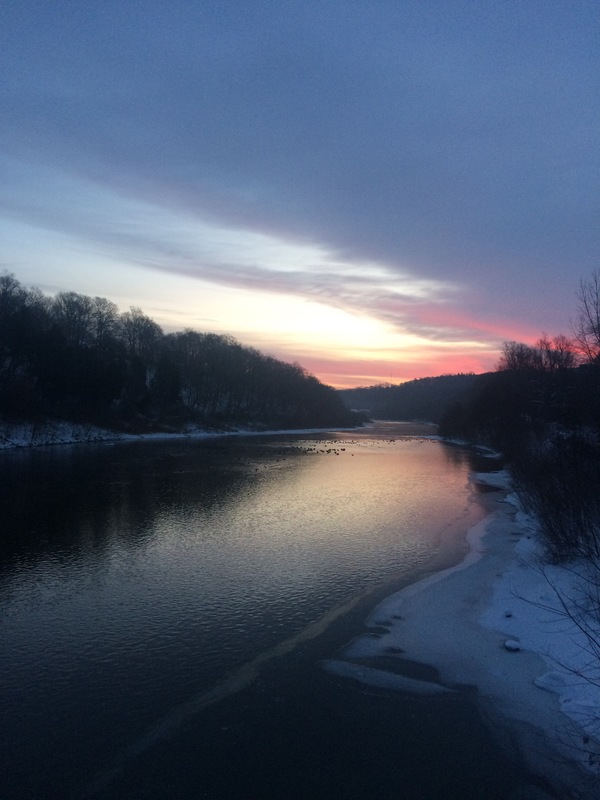 Instead, he writes a poem, designed by its beauty to incite both our love and knowledge of the Good itself. Kind of like my Christmas tree.